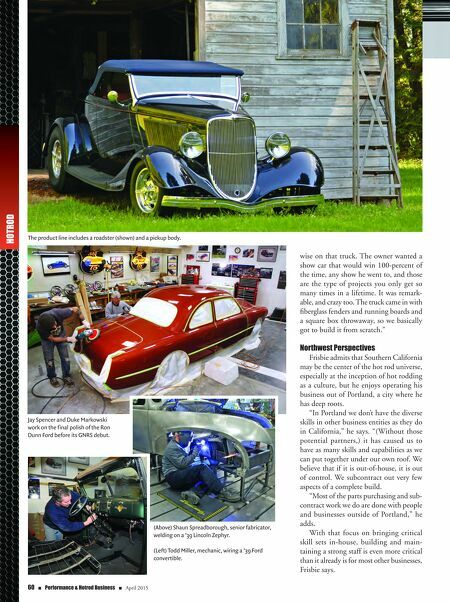 April 2015 n Performance & Hotrod Business n 61 "We have acquired employees through advertising in periodicals, through gradu- ates from trade schools such as WyoTech and McPherson College, and just plain ordinary walk-ins," he says. "To keep good employees it is necessary to provide a 'team' atmosphere and main- tain good chemistry throughout the shop," he adds. "It is also important to have the opportunities available to grow and learn new skills and develop new talents. And of course, being able to offer a decent wage so that they can afford a decent standard of living." Frisbie notes that while wages aren't as high in Portland as they are in California, where the cost of living and operating a business is notably higher, wages in Oregon are higher than some areas of the country. All of which factors into how he prices his work as a company. To keep the shop and its 15 employ- ees busy, Steve's Auto Restorations utilizes two main avenues for promotion: adver- tisements in magazines and periodicals, and attendance and competing in hot rod shows, outdoor events and concours events. "We also use the Internet continuously through our two website addresses (www. realsteel.com, and www.stevesautorestora- tions.com)," he says. The company has an online store that offers Internet sales, but Frisbie notes that he completes just as many sales directly over the phone, where his staff can answer direct questions customers have about the product. "Online sales are not a huge priority for us," says Frisbie. "We have an eBay store and a store on our website, both of which are nicely set up and are not a lot of work to maintain at this point." Challenges & Opportunities After 37 years in the business, you might expect that someone like Frisbie has everything pretty well dialed-in and on cruise control. You would be wrong, he says. In fact, the relentless drive to produce new and compelling designs keeps him on his toes on a daily basis. "The biggest challenge in hot rod and custom car building is to be able to con- stantly come up with new creative ideas," he says. "Ideas that are not like everyone else's and ideas that are not a repetition of the previous car that we just built. Cutting- edge ideas and innovations. To build a rod or custom that appeals to the masses, not just a fringe portion of the hobbyists." The reward for all that hard work? Being a part of a passionate community of fans and other builders—and to be rec- ognized as such. Currently, five of Frisbie's cars are now in museums, including a '37 Ford Phaeton that resides in the Petersen Automotive Museum in Los Angeles. "The best part of my job is to be around the cars and watch them develop in the build process," he says "and to be able to attend indoor and outdoor car shows and related events. "The future is bright for our industry as rodding and altering of vehicles is develop- ing with newer vehicles," he adds. "A shop just needs to be able to develop with the trends and the ups and downs of the indus- try to be able to be healthy and survive." With nearly four decades under his belt and a reputation for building some of the finest antiques, customs and hot rods in the country, Steve's Auto Restorations cer- tainly has that ability, in spades. Bryan Bidema, fabricator, doing lead work on the Ron Dunn Ford. Jay Spencer, painter.